The Chaîne is based on the traditions and practices of the ancient French Royal Guild of Goose Roasters, birds that were particularly appreciated in the middle ages. Its authority gradually expanded to the roasting of all poultry, meat and game. After the fall of the Roman Empire, gastronomy in Europe took sanctuary in the monasteries until the 15th century when the Renaissance revival in the arts, and the pursuit of good living, were predominantly promoted by the church. The monastic orders lived off the land, produced wines and spirits, and made their own breads, cheese or honey. The cooking of the monasteries helped to shape the regional gastronomy and, with the noble households, developed the culinary art. 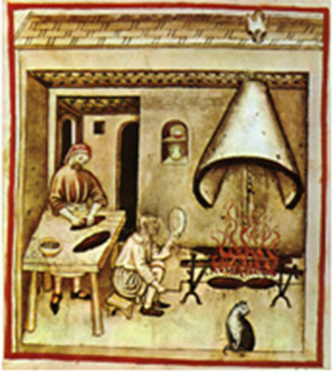 In the 11th century in the household of common folk, cooking was the task of women. But in the kitchens of the nobility a highly hierarchical world of men watched over food supplies and meal preparations. Vegetables were more for peasants but bread, accompanied by roasted meat and wine was the centerpiece of the diet of the nobility. Therefore, the rôtisseurs, the roasters, apart from the cuisiniers, were a crucial part of a household. The rôtisseurs took the sole responsibility for roasting, which was a highly sophisticated procedure. They had to choose the meat and lard it and then supervise the roasting process. They were also in charge of basting the meat and poultry during cooking to reduce the loss of moisture by evaporation. Roasted meat had to have a uniformly crisped and deeply caramelized surface to enhance both the flavor and appearance. Over the years all skilled workmen such as the rôtisseurs, the textile workers, the smiths, the saddlers or the masons assembled themselves into the fraternites or brotherhoods. These early trade bodies realized that it was important to work together, learn from each other, provide mutual assistance and make sure that their trade secrets were strictly controlled. The appearance of these ‘guilds’ (for the gold deposited in their common funds) was tied to the emergent money economy and to urbanization, which took place all over Europe. The French King Louis IX, later to be called "Saint" Louis, appointed Etienne Boileau as Provost of Paris giving him the task of bringing order and standards into the organisation of the various trades. So he collected and reviewed the statutes of more than hundred of these trades, among them the rules and regulations of the Goose Roasters, “Les Oyers’ and put them together in the ‘Livre des Metiers’ - the Book of Trades - in 1258. 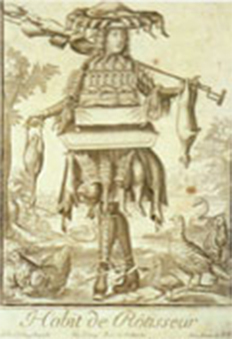 In 1509, during the reign of King Louis XII, some new statutes changed the name of the Guild to "Rôtisseurs" and expanded its activities to poultry, game birds, sheep and venison. In 1610 under King Louis XIII, the corporation was granted a royal charter and coat of arms. Industrialisation brought an end to the monopolistic guild system and it was finally replaced by free trade laws after the French Revolution. The National Assembly considered the guild system as contradictory to the 'volonte generale' as stated by Rousseau and abolished with the Loi d'Allarde the guilds on March 3, 1791. This made it easier for former cooks and servants of noble houses to open their own restaurants. 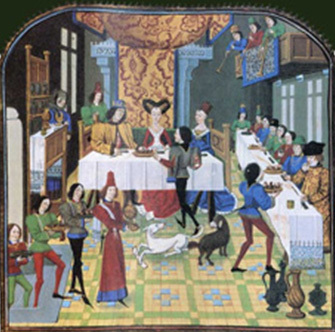 Since the 14th century interest in culinary matters was no longer limited to the Court and the nobility. All over Europe recipes were collected which eventually became the culinary literature. The seeds of gastronomy had been well sown and cooking never stopped striving for perfection and to become an art. There are a number of people who can be considered as the founding fathers of gastronomy: Taillevent, Brillat-Savarin, de la Reyniere, Sicci, Lamb, Rabelais, Careme or Escoffier. Their contributions not only developed the art of cooking, they also brought the various cultural components of food to our attention. In 1939 with the outbreak of war, saw serious food shortages. With the lack of raw materials it was no longer possible to grant Culinary Apprenticeships to the Roasters or Grillers. It was also impossible for mothers to initiate their daughters in the art of the table and this situation lasted for many years. The start of the Second World War virtually put an end to the golden age of gastronomy in France. At the beginning of 1950, when food restrictions were relaxing, Jean Valby, a journalist who had great interest in the diversity of the French cooking, had produced a savouring gigot a la broche, a fine leg of lamb. He invited two friends to enjoy it with him: Curnonsky, the Prince of Gastronomy and a gourmet, Dr. Auguste Becard. At the third slice, Curnonsky was overjoyed and congratulated Mrs. Valby who had supervised the roast and prepared the meal. He continued by adding that there was virtually a generation that neither know what a roast was nor even how to cook. An association needed to be established with the noble aim to make known and rehabilitate French culinary art. Dr. Becard then commented that during the War years everyone had eaten whatever they could find and as a result their digestive system had particularly suffered. He proposed therefore that the basic principle of the organisation should be one of simple, easily digested cooking essentially comprising of spit-roasts and grills. The realised that they needed to be joined by masters from professions associated with the culinary world. A few days later two professionals joined: Marcel Dorin, a rotisseur of long-standing and Louis Giraudon, a wraught iron craftsman and specialist in spit roasting equipment. The five met on the Wednesday of the Easter week 1950 for a dinner at the Auberge de la Truite, on the rue Faubourg Saint Honore. 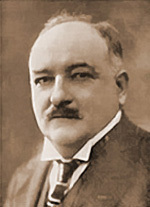 Jean Valby gave them some documents to read, which he had prepared regarding the constitution of the proposed association, its by-laws as well as an oath. His propostition did not envisage bringing back the ancient Guild of Spit Roasters but simply to resurrect its spirit. At the initiative of Jean Valby, and with anonimous agreement, the five decided that the association would be called the 'Confrerie de la Chaine des Rotisseurs. The « Confrérie de la Chaîne des Rôtisseurs » was founded and its Constitution officially registered with the Préfecture de Police in Paris on 3rd August, 1950 and published in the « Journal Officiel de la République Française » on 29th August, 1950, page 9316. September 1950 saw twenty guests attend the first 'diner amical'. 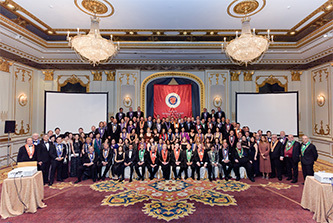 On January 25, 1951, at the Hotel Lutetia in Paris, the first Chapitre was held during which 120 members were inducted. Since then, the Chaîne des Rôtisseurs has continued to develop, not only in France, but throughout the world. Today, the Chaîne numbers more than 25,000 members in nearly 100 countries around the world. The international headquarters, the Siege Mondial, is in Paris where the society was founded. Curnonsky was the pen name of Maurice Edmond Sailland, a French writer, novelist, biographer and gastronome (born in Angers, France October 12, 1872, died in Paris, July 22, 1956). He was born into an old Anjou family in Angers in 1872. His mother died giving birth and his father abandoned him. He was thus brought up by his grandmother. At the age of eighteen he came to Paris to study for a Master’s Degree in Literature, but he was very much attracted by journalism. The name “Curnonsky” comes from the Latin cur + non “why not?” plus the Russian suffix -sky, as all things Russian were en vogue in 1895, when he coined it. In 1914, this pseudonym did get him arrested and imprisoned for several days on suspicion of being a Russian spy. He once said that this nickname was “my tunic of Nessus, as I am neither Russian, nor Polish, nor Jewish, nor Ukrainian, but just an average Frenchman and wine-guy (sacavin)”. He was known for his immense appetite and his size (1,85m; 120kg) and eventually combined his talents as man of letters and lover of good eating to the benefit of the gastronomy. With his friend Marcel Rouff he started a series of publications on regional cooking and the best places to eat in France. Therefore he often is considered the inventor of gastronomic motor-tourism as popularized by Michelin, though he himself could not drive. Throughout his life Curnonsky sought to restore the prestige to traditional and provincial cooking rather than the sophistication of certain grand Paris restaurants. Despite his popularity he refused to allow his name to be used in association with any advertisement or any PR activity. He was know as the “Prince of Gastronomes”, and he had in fact been duly elected in a poll of 3,000 chefs held by Paris-Soir in 1927. There was at the time a series of ‘Princes’, i.e Andre de Lorde, the Prince of Terror. The title Curnonsky received, no one else has been given since. As a result of being chosen he was invited to many dinners and receptions. He carried out his functions with a marvellous spirit. At the height of his prestige, to honor his eightieth birthday, eighty restaurants marked his favorite table with a copper plaque reading: “Cette place est celle de Maurice Edmond Sailland-Curnonsky, Prince élu des gastronomes, Défenseur et illustrateur de la Cuisine française, Hôte d’honneur de cette maison.” This led to the legend that eighty restaurants reserved a table for him every night in case he should show up, though by that point, he rarely went out. Supposedly in his later years he was so heavy he was unable to walk and had to be carried by six friends to his favourite restaurants. On July 22, 1956, at the age of 84, Curnonsky leaned too far out of a window and fell to his death.